Come experience the oldest square dance festival in Texas! The Austin Square and Round Dance Association (ASRDA) is hosting the 71 st year of the Mid-Tex Square and Round Dance Festival on May 10 th and 11 th , 2019 in Georgetown, TX. 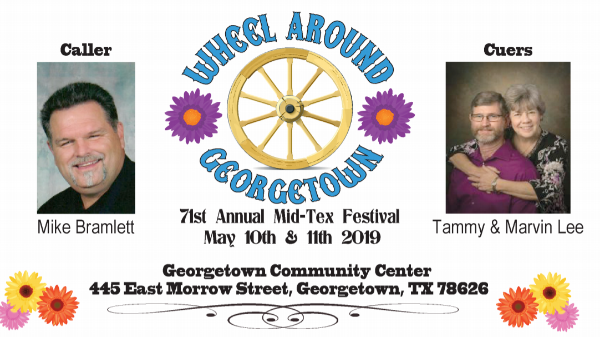 This year’s theme is “Wheel Around Georgetown.” Dancers from all over the State are will be there to share their love of square and round dancing. The first big square dance, called the “Texas Square Dance Festival.” was held in 1948. It was put on by a small local group of enthusiastic square dancers. . In 1949, the then “Mid-Tex Square Dancers Association”, had grown from the small local group to an association with over 1000 members! Two big dances, one in Austin and one in Luling were put on that year. The Mid-Tex square Dancers’ Association’s yearly dances continued from 1949 to 1962 during which time the group continued to increase its membership and promote square and round dancing in the State of TX. In 1962, after a lot of discussion, the members of Mid-Tex decided to dissolve the Mid-Tex Square Dancers’ Association. The assets of the Association were given to the Austin Square, Folk, and Round Dance Council with the promise that an annual dance festival be held. It was to be called the “Mid-Tex Festival” and it is still going strong today. Square dancing has roots in traditional Western European dances. The European settlers brought their dances to America where they blended different types of dance together throughout the 18th and 19th centuries to eventually become what it is today. Square dancing is the state dance of Texas, and the National Folk Dance of the United States. Square dancing itself has changed over the years. Women used to wear the traditional square dance skirts and petticoats and the men wore shirts that in some way matched their partner’s outfit. The music was traditional fiddle music. Today, it is no longer necessary to wear square dance attire or match your partner. Comfort is the key now. The music can be almost anything - pop, blues, patriotic songs, Broadway hits, country/western, and even rap. A person no longer needs to have a partner to attend a square dance. Square dancing is welcoming to singles. There are also many health benefits to square dancing. It increases lung capacity and muscle control, provides low impact aerobic exercise, increases heart rate, burns calories/fat, loosens joints, and increases blood flow. It also creates body rhythm, sharpens the senses, and relaxes the body. Two hours of square dancing is said to burn 400 calories. It sure beats going to the gym. Mental benefits of square dancing include sharpening listening skills, stimulating the brain, increasing retention, reducing daily stress, developing new motor skills, and giving one a pride in accomplishment. It is also a great social outlet. Square dancing is Fun, Friendship, and Fitness set to Music! Square dancing is taught and danced throughout the United States and all over the world. The calls are always in English so no matter where you are in the world, you can square dance. The Mid-Tex Festival in Georgetown will have something for every dancer. There will be 2 evening dances that will include both rounds and squares. There will be workshops during the day in both square and round dancing and Advanced level square dancing. We also have a special program for the single dancers called “Lords and Ladies of the Rings (and Squares)”, that provides a fun way for singles to find partners quickly and easily. As always there will be plenty of snacks, raffles, and a silent auction. Non-dancers are welcome to come and watch.